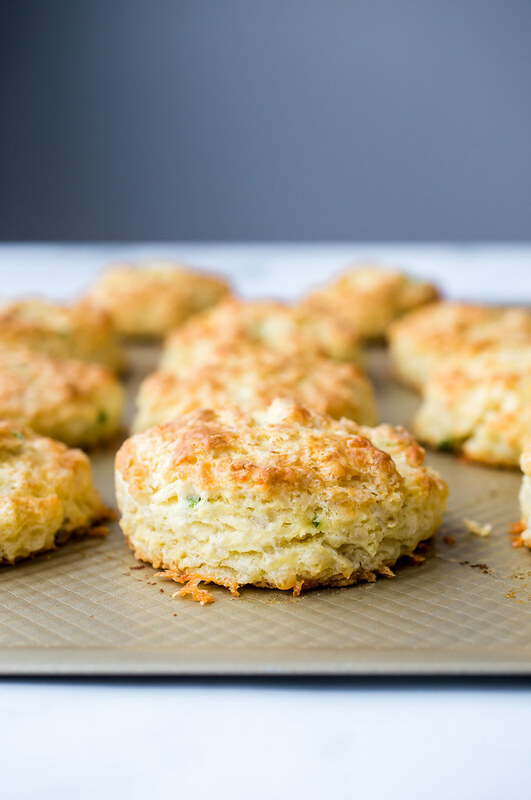 Jalapeño Cheddar Biscuits: Buttery, cheesy, jalapeño-flavored biscuits that are perfect for chili-dipping and without a whole lot of spiciness! Way back in the early days of this little space on the internet, I made jalapeño cheddar cornbread. Prior to making that cornbread, I had only ever made cornbread from that little blue and white Jiffy box. Before I really got into baking, the little blue Jiffy box cornbread suited my cornbread needs just fine. But that jalapeño cheddar cornbread was a game changer for me. Not just as a boost for my baking confidence, but also for my taste preferences too. That was BY FAR the best cornbread I had ever eaten and I found out that I L.O.V.E.D the flavor of jalapeño too! Who knew?! Since that jalapeño venture, I’ve branched out to making these jalapeño popper grilled cheese sandwiches, these cheddar jalapeño hamburger buns, and these cheddar jalapeño chicken burgers with guacamole more times than I can count over the years. I also roasted jalapeños and added them to homemade queso to dip homemade soft pretzels into. You all but have to drag me away from eating way too many of those pretzels. I’m my own worst enemy! So when I made that chili con carne with black and pinto beans a few weeks ago, I had this major hankering for something jalapeño-y to go along with the chili. I always get that hankering for big jalapeño flavor in the winter months. It’s like my body knows it needs something spicy to help keep itself warm! And rather than going in the cornbread with chili direction I usually feel, I went in the direction of these jalapeño cheddar biscuits instead. 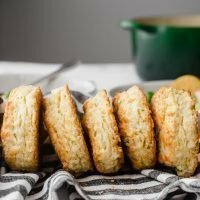 I’ve made so many different biscuit recipes over the years but I keep coming back to this base recipe as my newer favorite. 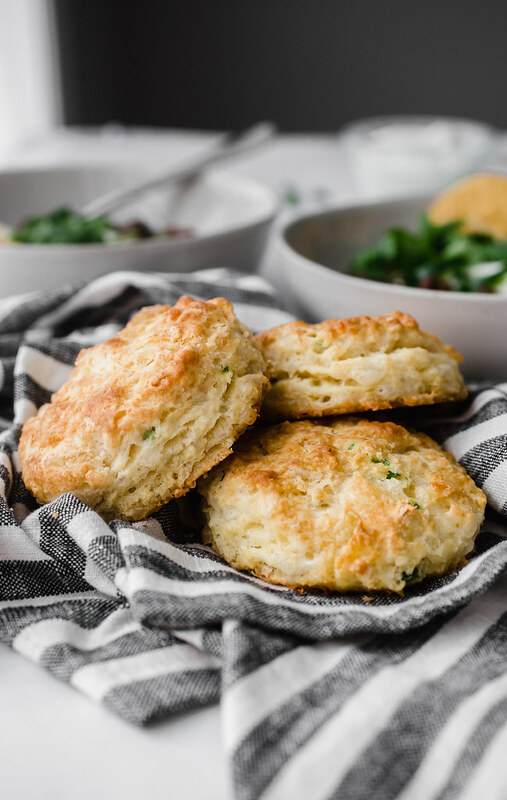 It’s a buttermilk biscuit that’s loaded with butter which creates lots of flaky layers in the biscuits. These buttermilk drop biscuits appeared here a few years back and while I love the craggy edges of a drop biscuit, I really love the repeating pattern of a batch of perfectly round biscuits on a baking sheet. So I added a chopped jalapeño and a couple cups of shredded sharp cheddar to my new favorite buttermilk biscuit recipe and from the oven popped some of the most delicious biscuits I’ve ever made. They had the big flavor of that jalapeño cheddar cornbread but with the buttery layers and a hint of tang from the buttermilk. And since I removed the seeds and pith from the jalapeño, they weren’t spicy at all! 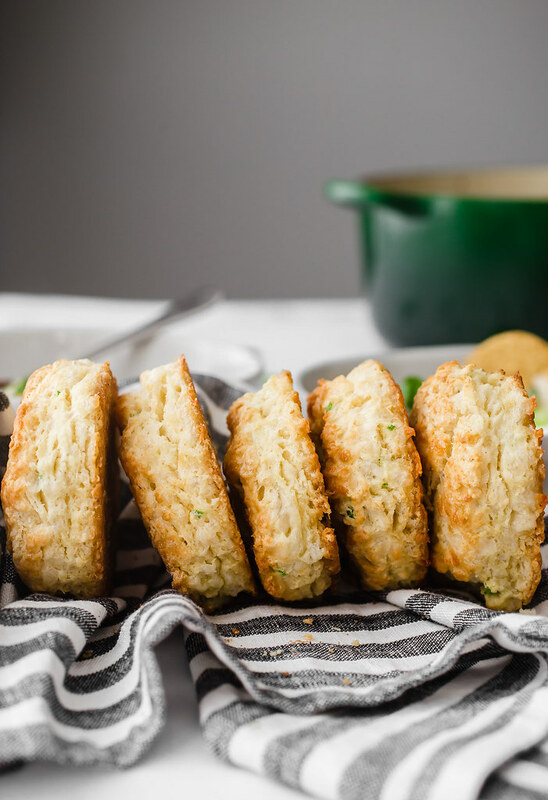 These jalapeño cheddar biscuits are perfect for dunking in your favorite chili or for making little egg sandwiches with on a snowy weekend morning. We love them and I know you will too! 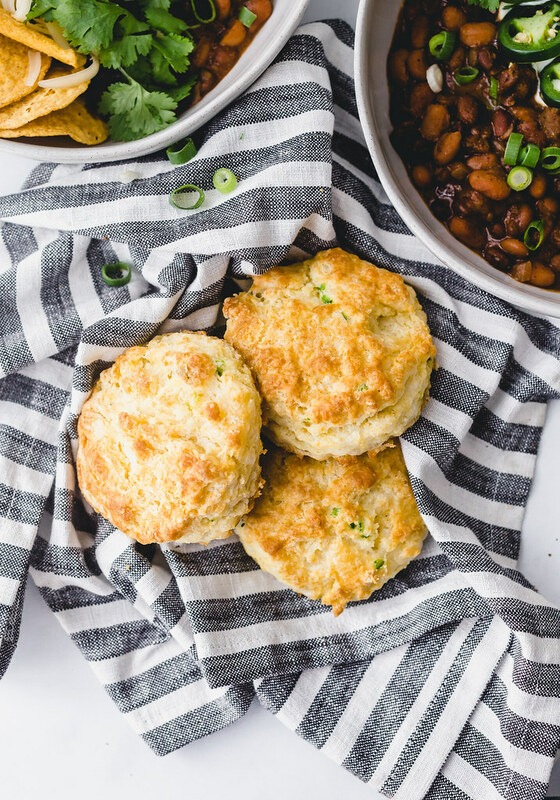 Buttery, cheesy, jalapeño-flavored biscuits that are perfect for chili-dipping and without a whole lot of spiciness! Measure/weigh the flour, sugar, baking powder, salt, and baking soda into a large bowl and whisk to combine. Using your fingers, 2 knives, or a pastry cutter, work the butter into the dry ingredients until you have pea-sized pieces of butter. Stir in the chopped jalapeños and shredded cheddar. Pour ¾ cup of the buttermilk into the bowl and with a wooden spoon or rubber spatula, stir the buttermilk in until a large, shaggy mass forms. If the dough seems really dry and it's not coming together easily, add up to another ¼ cup of buttermilk in small amounts until the shaggy mass forms. Transfer the mass to a floured work surface and lightly knead the dough until it comes together. 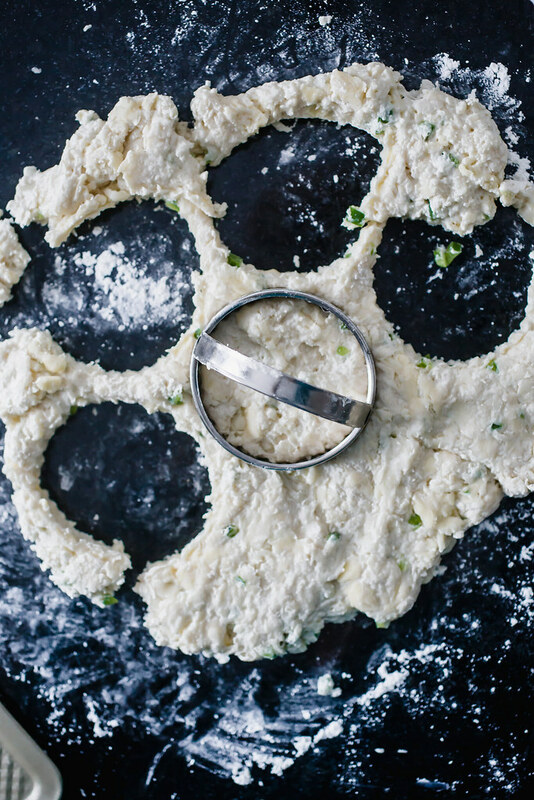 Pat the dough into a circle, about ¾-inch thick. Cut out rounds with a floured cookie/biscuit cutter and transfer the pieces to the baking sheet, reshaping the scraps and cutting out more biscuits as you go. 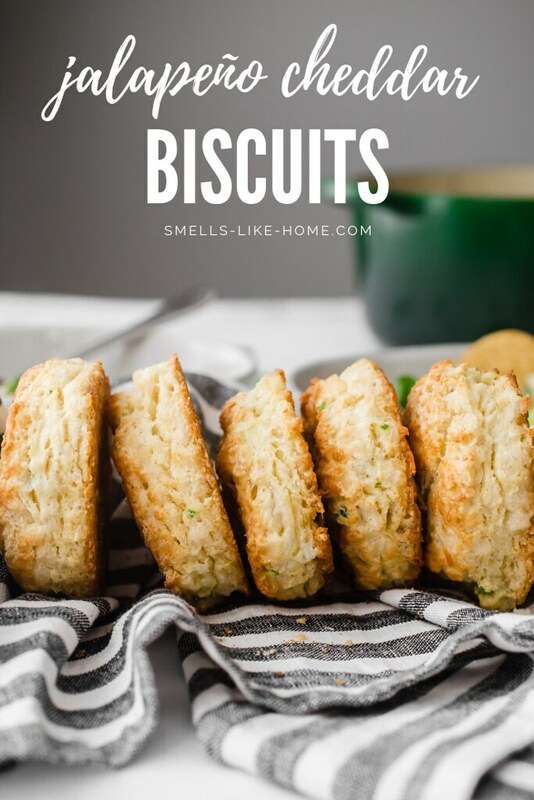 You can get 12 small or 9 large biscuits from this recipe. ﻿Bake for 12 to 15 minutes. Transfer the baking sheet to a wire rack and allow the biscuits to cool for 5 minutes before serving. Make sure your buttermilk and butter are really cold when making this biscuit dough. Cold ingredients + Hot oven = Lots of layers! You may want to consider using food-safe gloveswhen handling the jalapeños for this recipe. Since you'll be kneading the dough with your hands before cutting out the biscuits, you will run the risk of getting jalapeño juice all over your hands and this can sometimes be difficult to get rid of, even with multiple hand washes. Make-ahead Tip: These biscuits are best eaten on the day you bake them. But, you can make and cut out the dough in advance and freeze them to be baked off later. Just add 2 minutes to the baking them when you bake them from frozen (do not thaw them before baking). I’ve submitted this recipe to the Weekend Potluck. Head over there to check out loads of other great recipes!